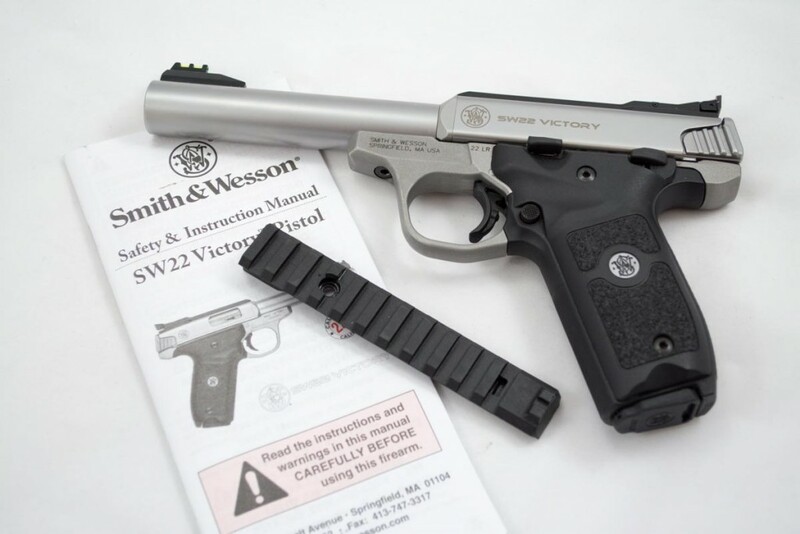 The Smith & Wesson Victory standard model. Sometimes good things take time. Sometimes it’s a lot of time, but that’s OK if the end result is worth it. I had the good fortune to visit the Smith & Wesson factory way back in November of 2014 to see a top secret new product. On a cold and icy morning, I sat in a classroom at the Smith & Wesson Training Academy along with a handful of other writers, anxiously awaiting the big news. To make a long story short, our Smith & Wesson hosts flashed up a picture of a new .22 LR pistol – the Victory. While I wouldn’t say the reaction was ho-hum, there was no standing ovation either. But then something weird happened. Paul Pluff, VP of Marketing started to show us how to take it apart. While he was doing that, Scott Volquartsen of Volquartsen Custom started handing out some amazingly spiffy aftermarket barrels. While Scott had us distracted, our hosts from Blue Heron Communications started passing out an assortment of optics and holsters. By this time, we had stopped listening to the presentation completely and were each tearing apart our sample pistols like kids at a free XBox party. Paul kept talking, but I think he knew none of us were still listening. Here’s the secret to easy takedown and parts changes. All models include a 5.5-inch stainless, match grade barrel. It’ll shoot right out of the box. You see, once we saw what the Victory was, we got it. The room full of industry old farts who have seen it all were positively giddy with this innovative rimfire pistol. Why? The Victory is whatever you want it to be. It’s designed from the ground up to be stunningly accurate, yet modular. Imagine a pistol made of steel and aluminum Lego blocks that still shoots sub-inch groups until you get bored. Want a new barrel? One screw pops the old one off and the new one on. How about swapping the adjustable rear sight for a rail? One screw. Field stripping for cleaning? Forget the frustrating parts disassembly and reassembly games of the Ruger .22 pistols. 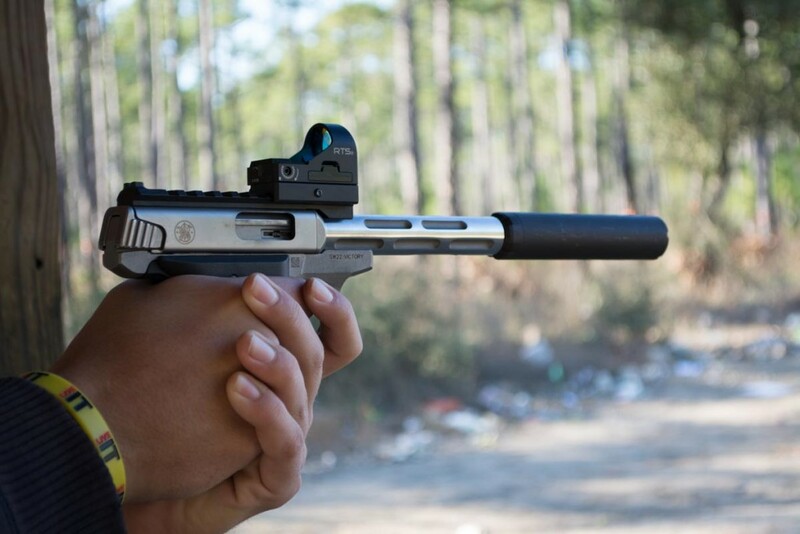 Like to shoot ultra quietly with a suppressor? It’s ready to go, depending on how you choose your base model or accessory barrels. 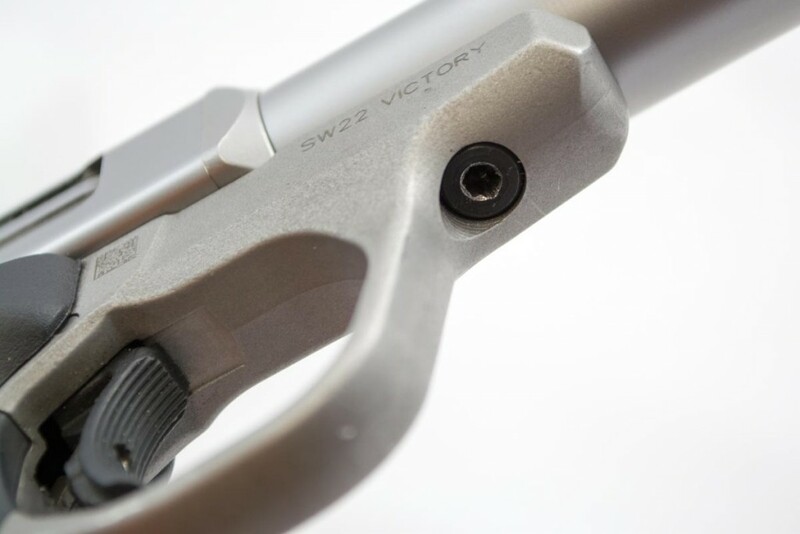 The Victory comes with a polymer rail so you can replace the adjustable rear sight base. The receiver and rear sight are serrated to reduce glare. This pistol is more like a dozen different handguns depending on how you put parts together. In short, it’s made in such a way as to encourage people like Scott Volquartsen to invent all sorts of aftermarket pieces and parts. The best part? The Victory has a starting MSRP of just $409, meaning you’ll pick them up for somewhere in the 300’s. First of all, there are three base models from which you can start your personal .22 pistol project. All begin with the same basic frame and 5.5-inch stainless steel, match grade bull barrel. The differences in the three base models are primarily cosmetic. The standard Victory has a non-threaded barrel. There is also a threaded barrel model and a Kryptek® Highlander™ camo finished version. 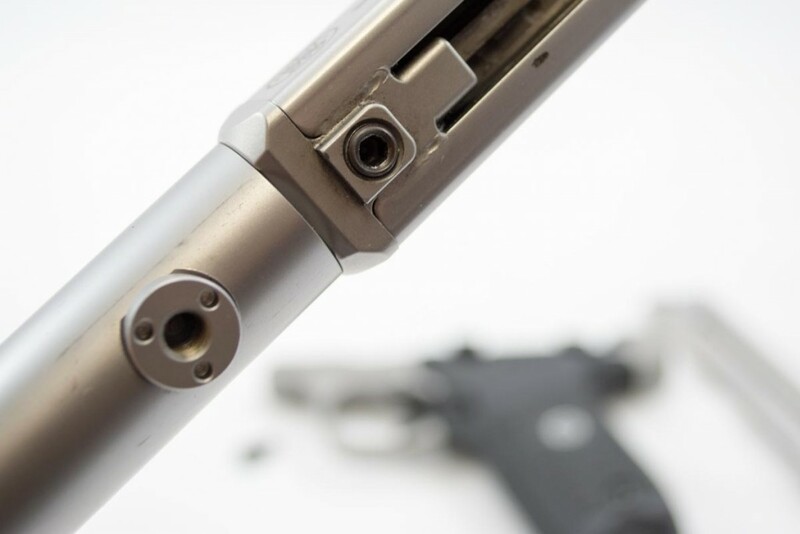 The core function features, with the exception of the threaded barrel, are the same between the three, so let’s take a closer look at the details present in all three. The receiver is fixed in position while the bolt is charged from the back. Note the overtravel adjustment screw in the trigger face. The frame, bolt, and barrel are all stainless steel, but with slightly different finishes. The frame area around the trigger guard area has a fresh from the forge roughed up look, which is kind of cool. The receiver and barrel are a bead blasted matte stainless steel finish, which does a good job of reducing glare. The receiver, bolt, and charging mechanism are similar to the Ruger 22/45 and Mark III series, with a fixed receiver and charging handle that one pulls to the rear. The feel is easy and silky smooth. No rough stuff in the bolt operation. The polymer grip resembles that of the Model 22A. The ejection port is generous and I had no function troubles testing over a dozen types of .22 LR ammo. The trigger is excellent, with a short take-up and crisp break. The pull weight is right at three pounds as measured by my Timney Triggers scale. As a result of the light weight and crisp operation, you’ll shoot this gun accurately with ease. The flat face of the trigger is serrated vertically and has an overtravel adjustment screw set into the face. The grip is made of polymer and will remind you of a Smith & Wesson Model 22A. 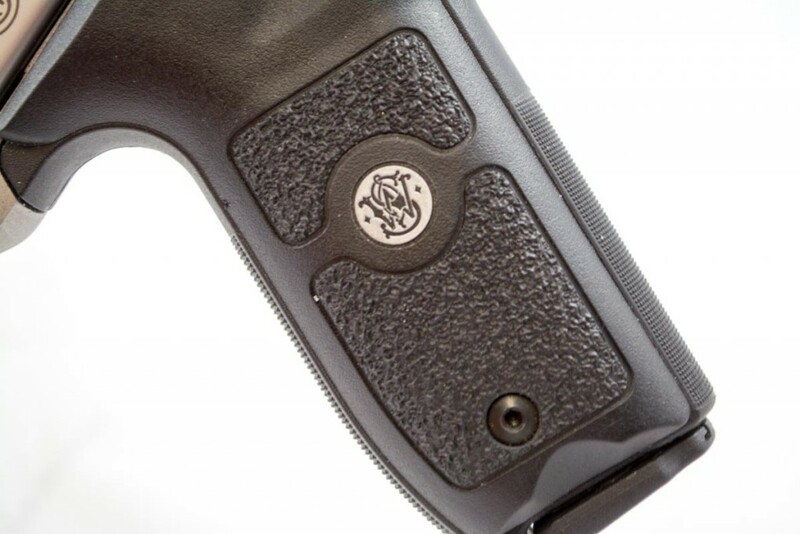 The sides of the grip have a stippled pattern and the front and rear straps are patterned with fine checkering. 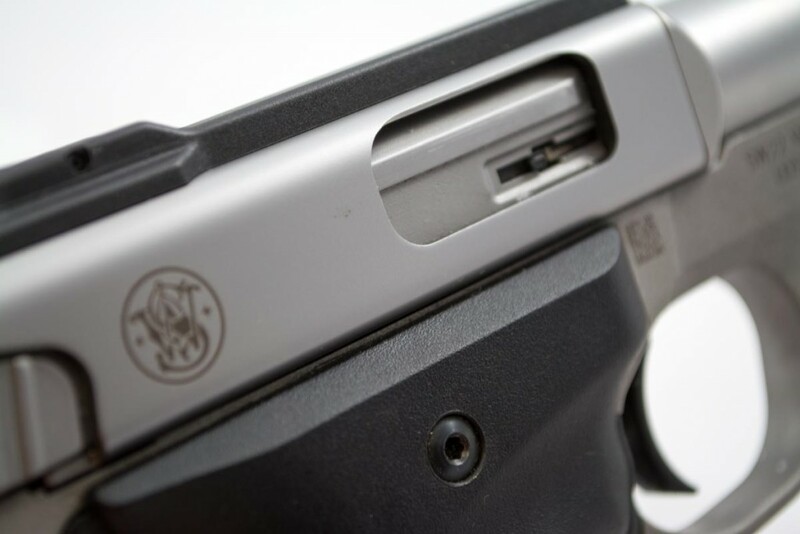 Like many .22 target pistols, the grip angle is more severe than an M&P or 1911 style. 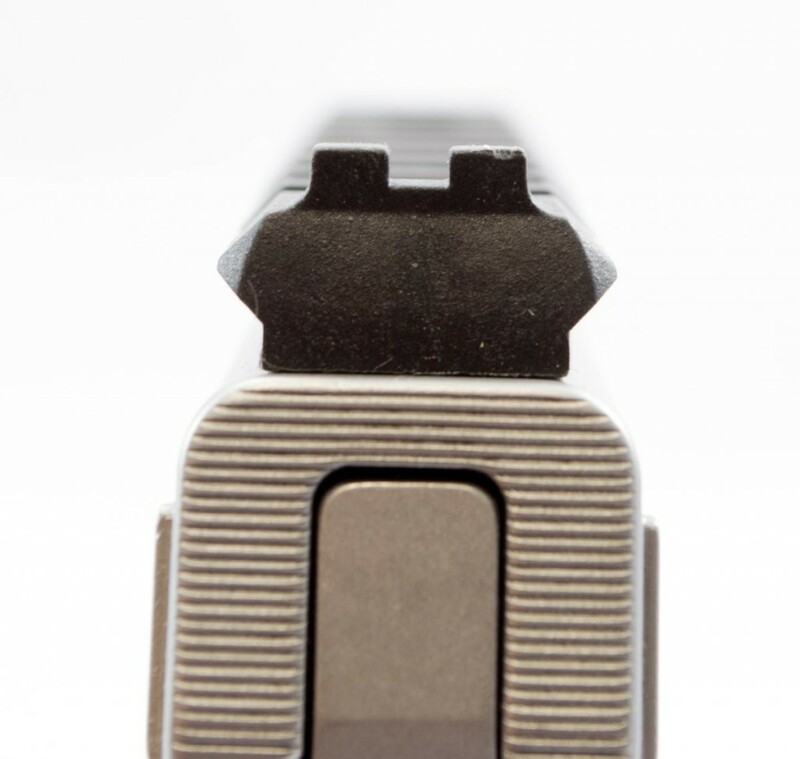 A magazine release button is on the left side of the grip in the traditional spot behind the trigger. 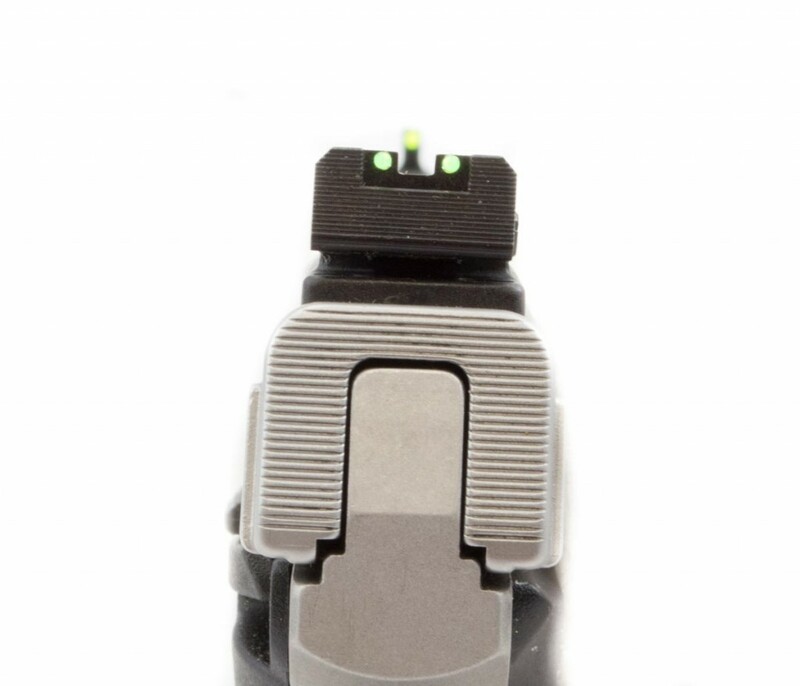 The rear sight is adjustable and features a fiber optic tube. The sights are excellent. 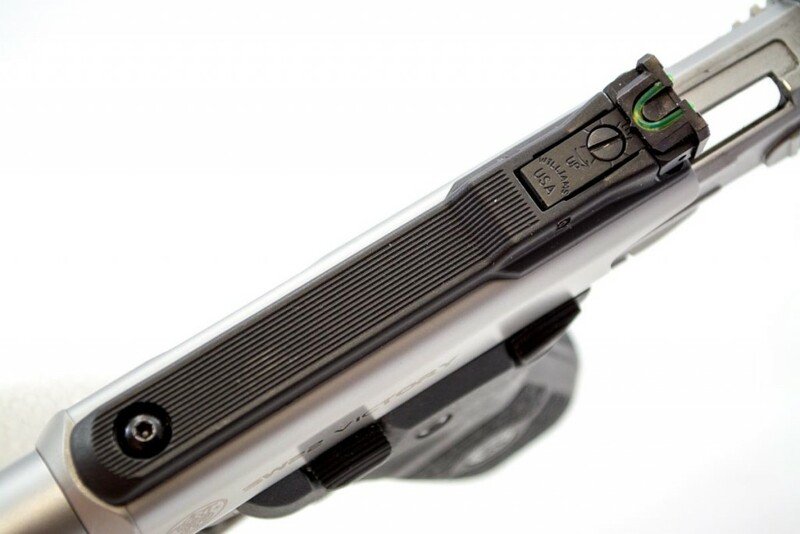 The front is a green fiber optic tube mounted on a removable steel base, presumably to allow either removal if optics are used or to provide another opportunity for aftermarket customization. The rear sight is adjustable for both windage and elevation and features a U-shaped green fiber optic tube where the ends flank the square notch. The back of the rear sight and platform in front of the sight are grooved to reduce glare in the sight picture. There is a frame mounted safety on the left side that pivots from the front. Flip the rear up to engage the safety and down to fire. It’s made of steel but wrapped in a polymer coating. It clicks on and off positively and has no mushiness whatsoever. I like it. About an inch forward of the safety is a slide lock lever, also polymer-wrapped steel. The take-down screw is inset and stays out of the way of your firing hand. The basic field stripped components. 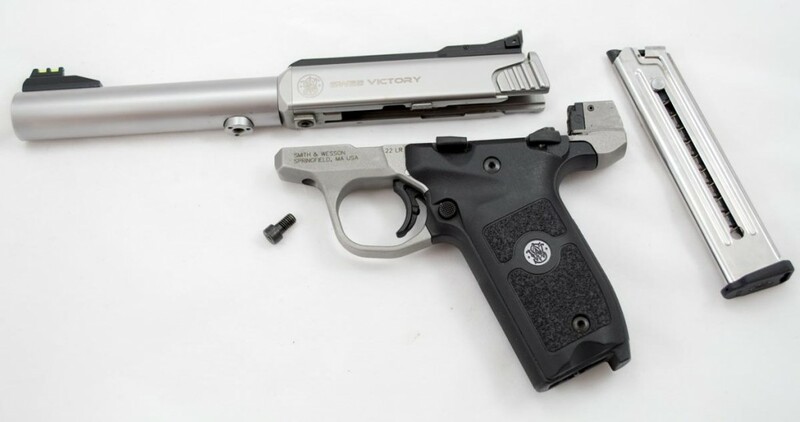 The Victory models all include two 10-round magazines in the box. 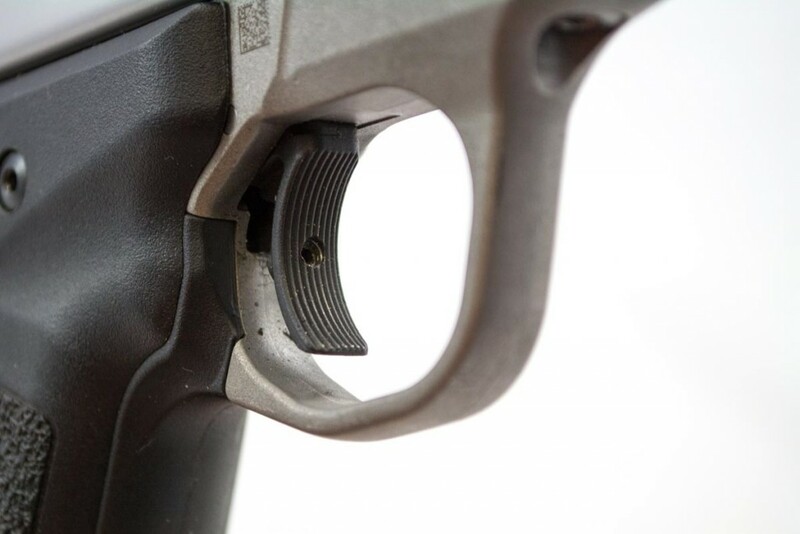 The bottom of the grip is cut to allow the shooter to pull the magazine out, although the steel magazines easily drop free on their own accord. OK, now let’s get to the fun part. Before I get into how you can reconfigure the Victory with aftermarket parts, let’s spend a minute on the takedown and field stripping process, because it’s brilliant. Once field stripped, the barrel locking screw is exposed. In this view, the bolt has been pulled out of the receiver. There’s an Allen screw just forward of the trigger guard that locks the barrel and receiver to the frame. Loosen this, and the entire barrel and receiver lift off the frame in one piece. 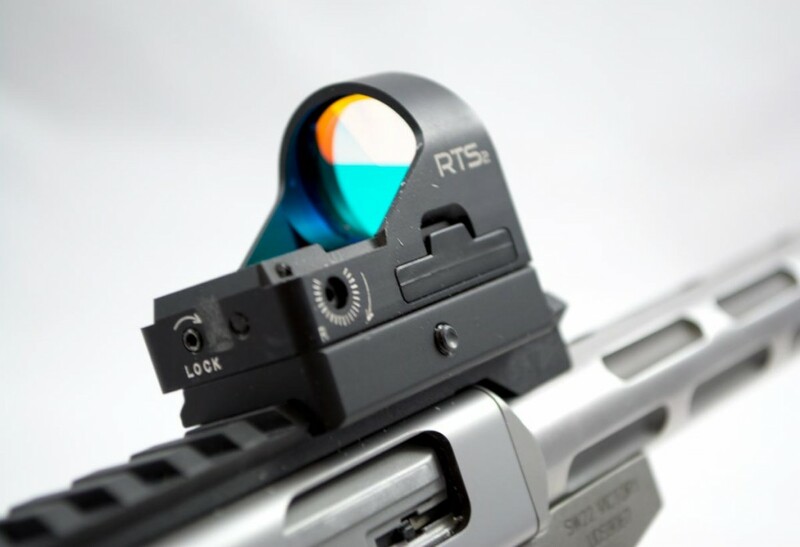 If you have optics mounted and zeroed, no worries, they remain untouched and unmoved from their mount. Once the barrel and receiver are removed, the bolt slides right out the back of the receiver. That’s it. If you want, you can drop the recoil spring out and clean to your hearts content. You can literally field strip and reassemble this gun blindfolded in seconds. Now that you know how to separate the barrel and receiver from the frame, things start to get fun. The bottom of the receiver has another Allen screw that secures the barrel to the receiver. The screw just serves as a lock mechanism, all alignment and fit is accomplished by careful shaping of the barrel and receiver. They fit tightly together without the Allen screw in place. Again, removing the barrel from the receiver doesn’t interfere with any optics mounted, although if you install a different barrel, your point of impact will likely shift. If you remount the same barrel, the pistol maintains its existing point of aim and point of impact relationship. That was one of the first things I tried, just because I could. Here, I’ve got the Volquartsen Carbon Fiber barrel installed. It only takes seconds to swap the rear sight platform out for the included rail. On top of the receiver, you’ll see the adjustable rear sight assembly This mounts to the frame with a wedge towards the rear and an Allen screw towards the front of the sight base. I mention this because in the box you’ll find a polymer rail segment that fits into this spot. Remove the rear sight assembly and mount the rail and you’re ready for optics. 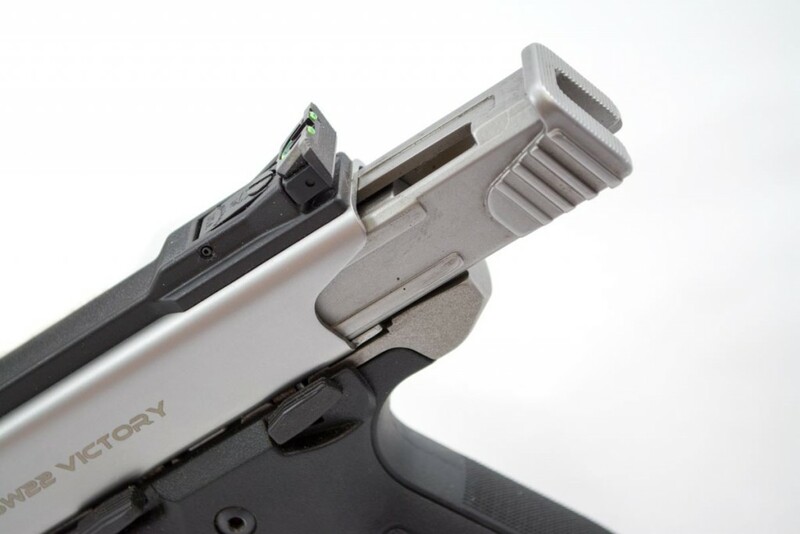 One super clever idea is that the rail has a notch sight in the back, so it serves as a rear “iron” sight too. If you don’t like the adjustable fiber optic rear sights, just replace that whole thing with the rail, and you have a plain black notch rear sight. It’s “oh duh” simple, but useful. Do pay attention to instructions when reconfiguring because proper screw tension is important. If you under or over-tighten mounting screws, they can work loose. When properly tensioned, I’ve had no trouble with that however. The Picatinny rail has a rear sight notch without the fiber optic tubes. Here, I’ve got the Volquartsen fluted barrel installed with the rail segment up top. In the photos here, you’ll see some of the aftermarket goodies you can get for the Victory. Barrels are a natural upgrade option due to the mounting design. I’ve got two different Volquartsen barrels that I’ve been testing. One is a 6.75-inch carbon fiber threaded barrel. The barrel itself is stainless steel, but the body is wrapped with black carbon fiber to reduce weight. It’s got a thread protector up front that serves to protect the muzzle just until you get your ATF tax stamp for a silencer. The second is an I-fluted bull barrel that measures six inches. Well, that’s just the actual bore length. 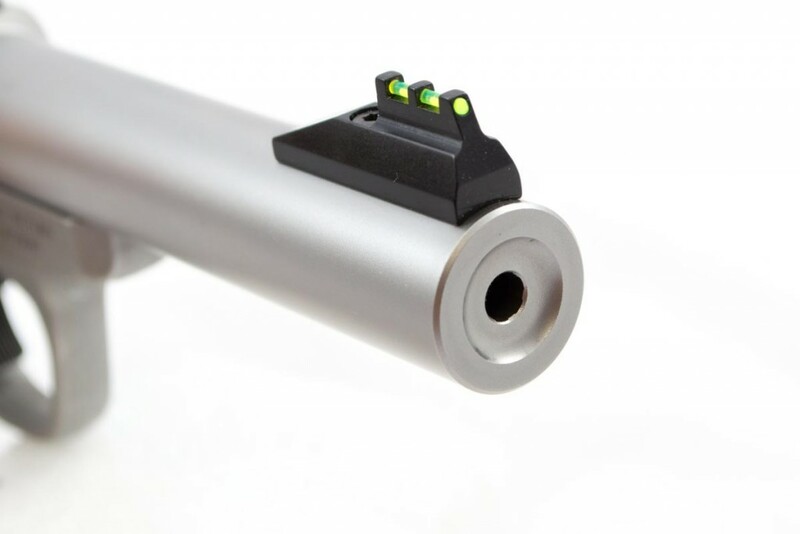 The barrel has a matching blow compensator that adds an inch and a half to overall length. I say “matching” but the barrel and compensator really look like one solid piece of metal. When we got them at the sneak preview, most of assumed it was one solid piece of stainless steel with compensator ports machined in. That’s how precisely the Volquartsen folks fit these parts – they are literally seamless. A couple of Victory-compatible Volquartsen barrels. The Victory shown here with the Volquartsen I-Fluted barrel, Silencerco Sparrow suppressor and C-More RTS2 red dot sight. 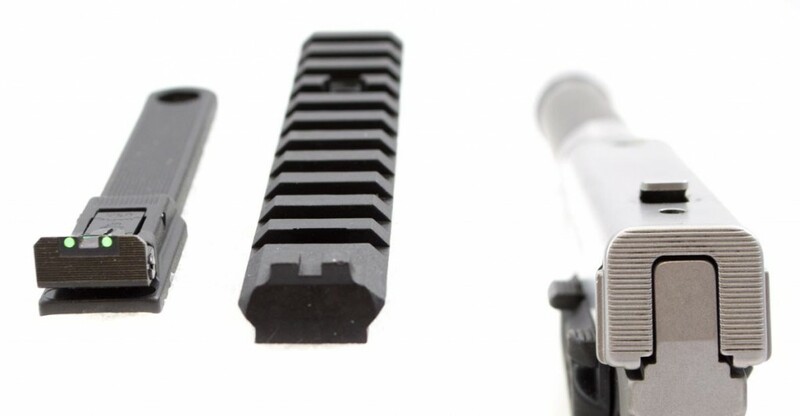 The rear sight base and rail are also great candidates for aftermarket development. I’d bet a ham sandwich that the Volquartsen folks will produce a steel or aluminum rail before too long. I’d also expect one or more companies to crank out some beautiful wooden grips. Given the way front and rear sights are mounted, that’s another area where I anticipate seeing some interesting third party products. At the preview event, we were able to shoot these pistols immediately at the Smith & Wesson Training Academy. The giddiness continued. Every shooting bay had one of us with a pile of barrels, optics and ammo reconfiguring between every shot string. It was immediately apparent that the Victory is a shooter. The standard bull barrel has everything to be proud of, and as expected, the Volquartsen barrels performed even better. For accuracy testing I mounted a Bushnell Elite 3500 handgun scope. A sweet configuration. 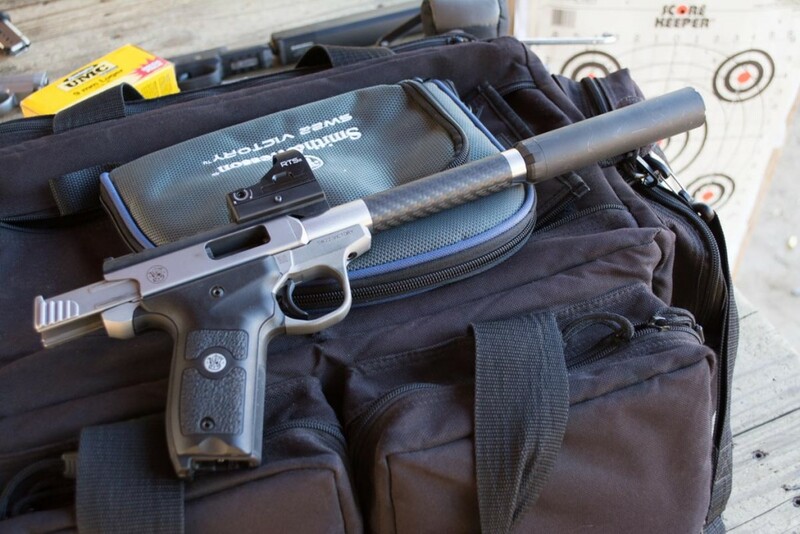 The lighter carbon fiber barrel helps offset the weight of the silencer. Shortly after the event, the Smith & Wesson shipped out our evaluation units so we could do some extended testing back at home, so I’ve been able to shoot this pistol for over a year now. I’ve got quite a few .22 pistols, but this one has risen to the top of the favorite list. The feel is outstanding, and it points naturally for me. Add in a quality factory trigger and great accuracy and what’s not to like? I tested accuracy with both the factory match barrel and the Volquartsen fluted barrel. The safety and slide lock are steel wrapped with a polymer cover. Speaking of accuracy, I tested a variety of .22 ammo over time, shooting multiple five-shot groups with each on different outings. I later averaged the various groups from each ammo type to see how the long-term average group size worked out. I did this using the standard factory 5.5-inch bull barrel and repeated the tests using the Volquartsen six-inch I-fluted barrel. While I was at it, I checked average velocity using a Shooting Chrony Beta Master Chronograph placed 15 feet down range. Here’s the summary. As you can see, this pistol will shoot. Even the inexpensive bulk ammo turned in excellent accuracy results and when higher quality ammo turns in .50-inch (and less) average group size, that makes me happy. 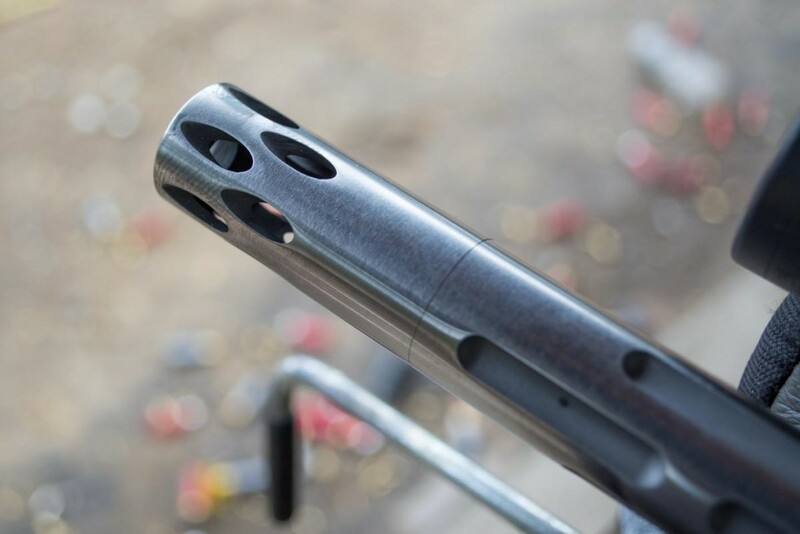 The muzzle device on the Volquartsen fluted barrel. Not too shabby for a 25-yard, five-shot group. 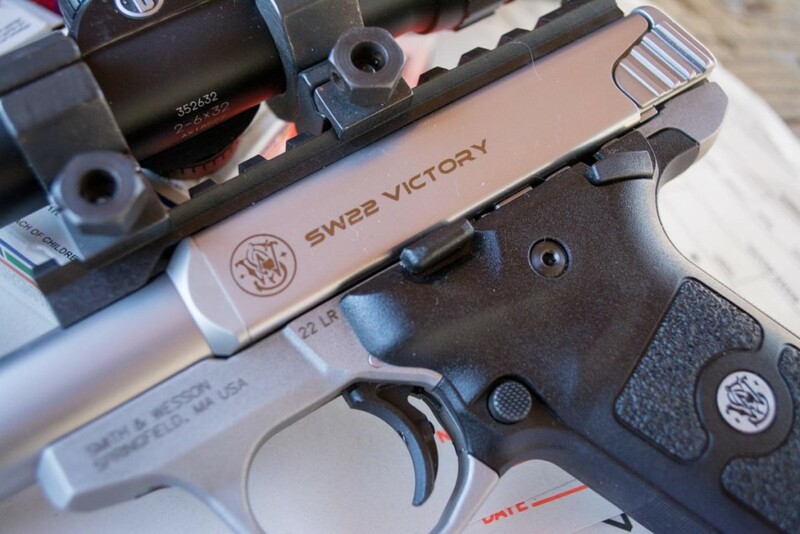 The Victory comes with two 10-round magazines. I used the C-More RTS2 red dot sight. It’s a great fit for this pistol. I absolutely love this gun. I test a lot of guns, and quite frankly, it’s rare to find one that I don’t enjoy or at least appreciate. It’s even more rare to find one that makes me smile every time I shoot it. The Victory is one of those guns. If you like effortless plinking, it’s highly recommended. Just beware that you’ll be customizing your Victory forever, but that’s most of the fun. About the author: Tom McHale Literary assault dude writing guns & shooting books and articles. Personal accountability rocks! Even the inexpensive bulk ammo turned in excellent accuracy results. Thank you for what you are sharing very helpful. Dear Ruger Friends,I am a 70 year old (ouch) Disabled Combat Infantryman who served with the First Air Cavalry Division back in 1966-67. As a Machine gunner…..I carried a sidearm. A Colt model 1911 .45 Caliber ACP semi-automatic pistol. As an experienced Gunner I knew I needed to hump at least 7 magazines during our Endless Combat Operations. I own a gorgeous Ruger Mark II, six inch barrel…..stainless steel pistol. Tapered barrel….gorgeous weapon. And accurate? Extreamely accurate. But….it is a pain in the tail to reassemble. For me? I developed a method of spraying a heavy duty gun cleaner on all parts first. Then use canned air…..then a lube/cleaner spray before using a bore rod with the proper brush and cotton cleaner pad. I can field strip this thing….but not easy to put totgher again. I have been tempted to buy either the Browning Buckmarrk .22 caliber pistol or now….this recent S&W Victory unit. As a Combat Veteran I do not underplay a decent .22 Caliber Long rifle firearm. However…..as a recent member of the Pocono Pistol range…..three years going each week….I learned that the best ammo for any .22 Long Rifle firearm is the CCI brand….copper jacketed mini-mags. Not the lead tipped….nor the spread shotgun rounds. (hollow points) Federal ammo is the worst. I looked them up and emailed them in a smart, mannerly email telling them that as a retired Machinist of 36 years….after my six years in the Infantry……that their rounds had zero quality control. No answer. Two weeks later? Same thing. So Federal is not the round you want. I had nothing but jams and misfires. As a combat Veteran? This cannot happen. Your new fan, James F. Breen, Machine gunner, Company D. 2/12th. Cav. First Air Cavalry Division, Vietnam…..1966-67. I am a 70 year old (ouch) Disabled Combat Infantryman who served with the First Air Cavalry Division back in 1966-67. As a Machine gunner…..I carried a sidearm. A Colt model 1911 .45 Caliber ACP semi-automatic pistol. As an experienced Gunner I knew I needed to hump at least 7 magazines during our Endless Combat Operations. I own a gorgeous Ruger Mark II, six inch barrel…..stainless steel pistol. Tapered barrel….gorgeous weapon. And accurate? Extreamely accurate. But….it is a pain in the tail to reassemble. For me? I developed a method of spraying a heavy duty gun cleaner on all parts first. Then use canned air…..then a lube/cleaner spray before using a bore rod with the proper brush and cotton cleaner pad. I can field strip this thing….but not easy to put totgher again. 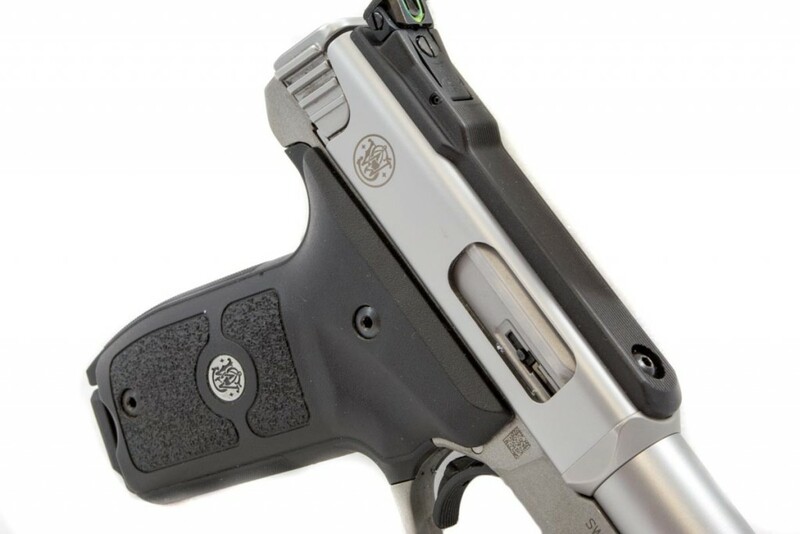 I have been tempted to buy either the Browning Buckmarrk .22 caliber pistol or now….this recent S&W Victory unit. As a Combat Veteran I do not underplay a decent .22 Caliber Long rifle firearm. However…..as a recent member of the Pocono Pistol range…..three years going each week….I learned that the best ammo for any .22 Long Rifle firearm is the CCI brand….copper jacketed mini-mags. Not the lead tipped….nor the spread shotgun rounds. (hollow points) Federal ammo is the worst. I looked them up and emailed them in a smart, mannerly email telling them that as a retired Machinist of 36 years….after my six years in the Infantry……that their rounds had zero quality control. No answer. Two weeks later? Same thing. So Federal is not the round you want. I had nothing but jams and misfires. As a combat Veteran? This cannot happen. Your new fan, James F. Breen, Machine gunner, Company D. 2/12th. Cav. First Air Cavalry Division, Vietnam…..1966-67. I performed and recorded the titled song ”Misirlou” which Quentin T. created the movie ”Pulp Fiction” from listening to the energy from me playing my guitar over and over. As soon as the S&W SW22 Victory target model (SKU 108490) becomes available in the People’s Republic of California, my barely-used Ruger Mk III will be replaced. The Ruger is a good shooter, but whatta pain in the @$$ to disassemble/reassemble for cleaning! Jus say’n—-take a lool at a Mark IV. Little more money, a lot more pistol! Well, the Ruger mark IV is a real nice gun. I have it and also have the Victory. Both shoot well, but, being honest, when i saw the Mark IV i just had to have it. I had a Mark III for one week, went to clean it and reassembled it and traded it in at a huge loss. So, when i was shown the Mark IV i was amazed and now have one. Holding the guns one gets a definite opinion on which is more comfortable to hold and shoot. Just to reaffirm my opinion i just took both of them out and held them and compared both. The Victory, in my opinion is just more comfortable and better balanced. If i had to have just one it would be the Victory. Takedown of either is simple. and to feed. Otherwise it liked most ammo. Great fun to shoot. Be careful to tighten the take down screw firmly. It tends to loosen during range work. Every time I go to the shooting range, I wind up shooting my Victory about 80% of the time. It is just so much fun to shoot. I’ve put over 4000 rounds through it with not one problem. You can’t go wrong with the Victory! As for the lubing, you may want to try something I was informed about in a class of folks taking defensive shooting course. We were using M4’s and handguns. One instructor was a sheriff’s deputy. He stated that if you take the bolt carrier out of the M4, drop it in a jar with Mobil 1 Synthetic oil, the gun will run all day without a hiccup. I’ve tried it and it does do well. Maybe try a few drops on your Victory slides and see how it goes. Looking at buying a 22 pistol. 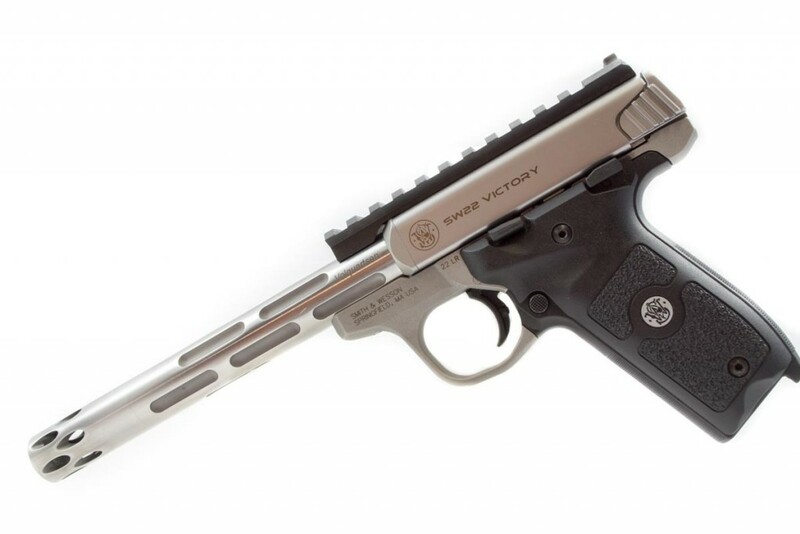 Ruger mak iv or s&w victory? Any advise would be much appreciated. I have both. As i just commented above, both are beautiful guns, easy to take down and clean and are very accurate. But, in my opinion i lean towards the Victory. It just feels more comfortable. Better balance. Good luck in your choice. I bought this gun about a month ago and just love it. I am thinking about putting an optic site on it. The question I have is do you mount the optic site closer to the front or back of the picatinny rail? I have never seen so many different opinions on one firearm, there are only 2 things that I do know,#1 I own a Victory and love it, #2 I feel so sorry for the folks that live in the communist state of California!!! I have fired over 500 rds. And have had 1 or 2 jams every clip, talked to a S and W technician and he stated that I should clean real good, have cleaned and bore brushed too many times to count, have tried 6 or 7 different brands of ammo, still get 1 or 2 jams every clip using both clips the gun is very accurate but I am tired of clearing jams! Any suggestions? I had two malfunctions with the Victory’s very first magazine but through experience I knew exactly how to correct the problem. It’s quite simple. Just lube the slide heavily. I’ve since fired 2500 rounds through the gun with every conceivable .22 cal. ammo from the very cheapest to the most expensive match ammo on the market WITHOUT a single misfire. It has a nice three pound trigger and is both reliable and accurate. I sold my Pardini match pistol because age has reduced my ability to compete at my former level, but in my youth I would have been confident to compete with the S&W Victory. It’s a joy to shoot. My Victory is still new, so it may need to be broken in a bit more. However, I’m still trying to find ammo that functions properly all/most of the time. I just fired 100 rounds of Remington 22 Golden Bullet, and it was complete crap. I had multiple failures each magazine. I’m trying extra lube on the slide hoping that will help. I had that same problem. I took it back to my gun dealer. 22lr ammo is dirty ammo. I had done cleaning on the gun before. The gunsmith took the ejector apart ( think it is made out of plastic) cleaned it and I have had no more Problems. Hope this helps. I bought an SW22 Victory this May for just ender $400. I took it to the range and put (2) Brands of Target Ammo (Eley, CCI) through it, plus (3) brands of HV ammo through it (Win HVHP, Federal Pistol Match, CCI HVHP). The pistol handled all ammo tested without a glitch. 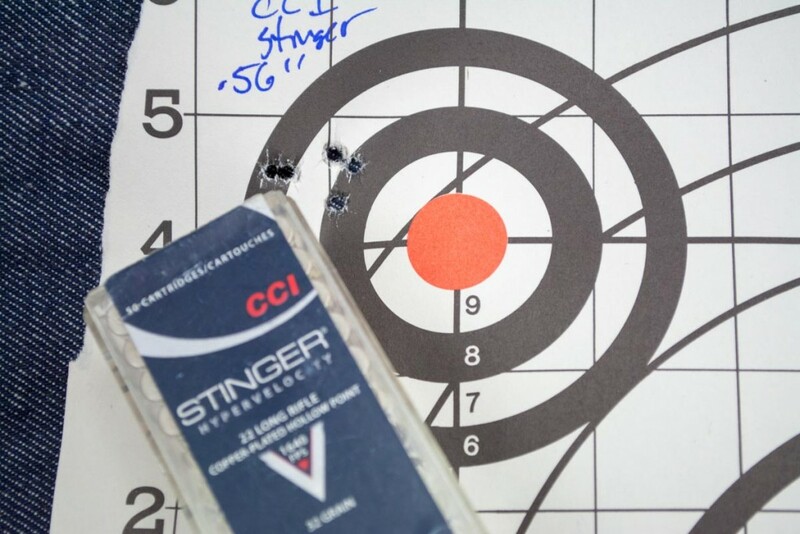 Smallest groups were with CCI HVHP and Federal Pistol Match at 25 yards, in that order. Groups were around an inch with CCI Mini Mag RN when I did my part. So far I have had it at the range for (5) sessions of about 100+ rounds each with no bobbles, no FTF or no FTE. I am impressed with this pistol for under $400 and would recommend it for target shooting or general plinking. Where does one buy to Bushnell scope mounting rounds that are shown in the article? I’ve looked all over and can’t find them. Purchased this gun about a month ago on a recommendation and finally went to the range. Can’t tell you enough how happy I am with the purchase. Easy, fun to shoot, and damn my accuracy was unbelievable. Would highly suggest making this one for the collection. Just purchased the Victory .22 from S&W. At the range the gun malfunctioned at the first shot. The slide will not return to fire position and had to be pushed forward for each shot. Using high velocity jacketed ammo 1250 fps and lead Thunderbolt ammo also. Same problem with both. When it does fire it’s very accurate at 25 yards. Wondering if it’s the ammo or a lubrication problem….Anyone else having this problem…..???? Well, I was considering a Victory. Thought I would read some comments about it. Just read all the previous comments and now wish I hadn’t. Just like reading reviews on anything. We all have different opinions. Think I’ll quit doing it. You take a chance on anything you buy now a days. I purchased this pistol about 6 months ago. I have shot it all most every week since I got it. It runs like a clock and takes every kind of ammo I have tried. It is easy to take down and clean. Every week I go to a indoor range for one hour. I shoot 100 .45acp, 50 .38specials and 100 .22LRs. I have had no failures to load, fire or eject. The only time it even hiccups is when one of the .22 rounds does not fire because of bad ammo. So far I have fired remington golden, cci, American eagle, thunder bolt, Winchester and a few other kinds of ammo with no problem. I wish my browning buckmark was as reliable as this SW22. I recently purchased this firearm after I looked down the barrel and saw those nice sights and an auto sight picture. It’s a natural pointer, the sights are excellent, the trigger is excellent and it’s one of those guns where even if you try to miss the bullet somehow finds a way back to the group. 616 rounds through the barrel and yet to have a FTF, FTE. What a shooter, S&W did it right, bravo! Shot 15 rounds, barell completely fouled up to where a patch would not go thru it…rear sihgts wouldn’t adjust, sent it back. They replaced the barell. Got it back shot it again, 4 shots, the ejector broke. Sending it back again … Complete junk. I had the same thing happen. Turned out I was the ammo Never use Remington thunderbolts.It was so bad I thought I destroyed the pistol. After I got rid of the fowling(It took some doing) I ran Winchester bulk ammo through it and it will drive tacks. I can’t speak to the ejector issue mine has functioned flawlessly. 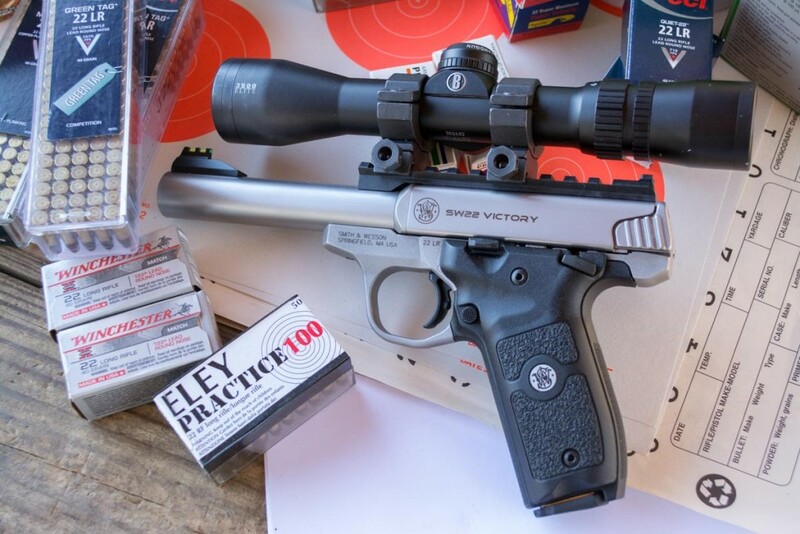 I finally got my Victory 22 LR to the range for an initial test. I only had time to load up a few magazines of CCI Mini Mag & Federal Preminum Standard Velocity Target to test functions and I was shooting off-hand at 50 yards, not looking for group size but just function. No FTL, FTF, or FTE problems over the 100 initial rounds fired. I have a Bushnell First Strike Red Dot sight on the Victory 22 for the optics and was very pleased with my initial outing. I own ( 10 ) other Browning, High Standard, Ruger, S&W, semi auto and revolvers. This is the least amount ( $380 ) I paid for a 22 pistol and the quality and performance is a super value for the price point. I bought this with my wife and grand children in mind, but will venture to say I will be shooting this one a lot. My only negative is the grips . . . they are a bit small in my hand ( similar to the standard Ruger grips ) I will be looking for some OEM grips to resolve that situation. For the price I think this is a very good product and the ease of take-down along with additional SW & Volquartsen barrels simply add to the value of this product. I would say it’s a winner . . . Interesting to see so many people criticize a gun they’ve only seen a picture of and never actually held, much less tried at the range. “Boo-hoo, it’s ugly and silver colored.” Don’t buy one and move along. 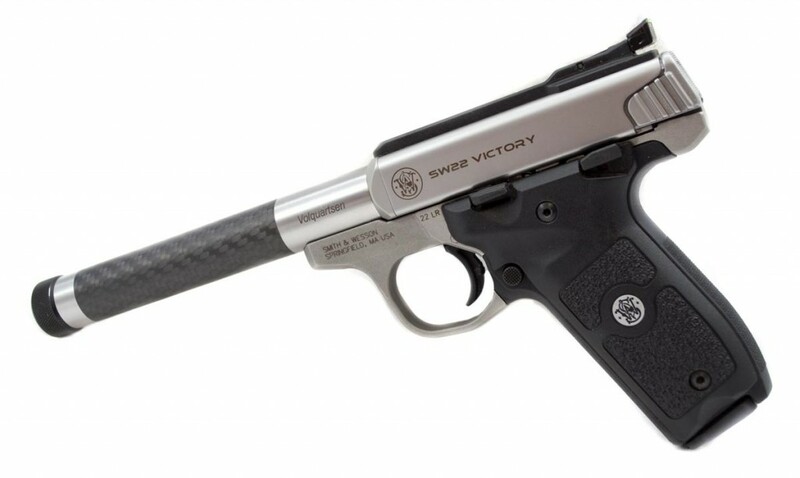 It would seem that S&W may have hit a home run with the Victory if they only market it to the girlie men who aren’t smart enough or are too lazy to field strip a Ruger MK. Really, the Ruger’s just aren’t that hard, maybe the whining would go away if Ruger required a man card to purchase one of their .22’s. The pistol does seem to be a shooter but my God could they not have made it any uglier? It looks like a home made Pakistani copy of a Ruger standard model. Beauty is in the eye of the beholder. I think it looks fine. 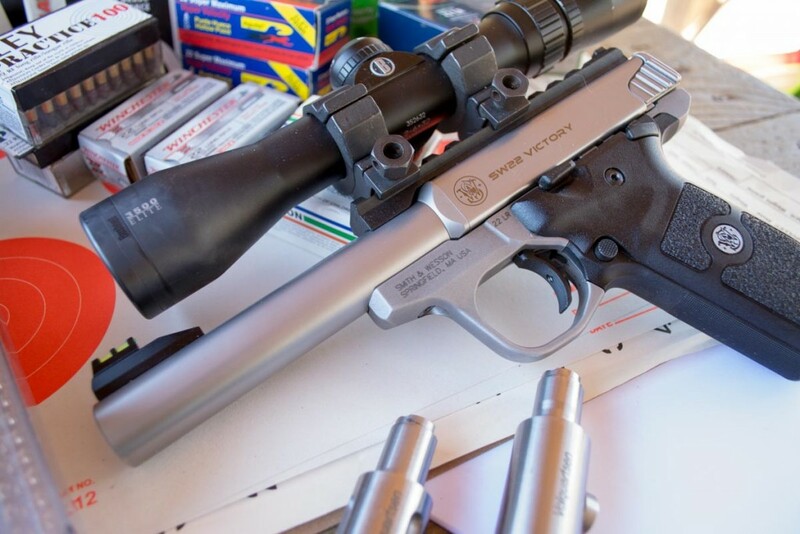 I tried the CCI Quiet ammo in my S&W Victory and it would not eject the spent brass.Also to get the results at 25 yards,( these small groups)), are you you clamping the pistol in a machine rest ? Other than a custom holster is anyone makine a holster for the Victory with a optic sight? Of course it did not eject. It says in the user manual to use “high-velocity”, which is standard for most semis! Some do take “standard” velocity, but the quiet stuff does not have enough powder/power to eject! Purchased the Victory and having trouble with the ejection of rounds. Have tried 4 different types of ammo, Ely, CCI, S&W and Federal, all have had the same results. The round isn’t cleared from the pistol before the next round is being loaded. Would say 50% of the rounds don’t eject. Any known solutions or does it need to go back to S&W? Purchased 4/21/2016 – Mine had the same issue after about 300 target loads of 3 various mfg’s. So that tells me she seems to like a bit more oil up and around the slide. After a quick down and dirty lube job… back to normal and another box or two. Once this Victory breaks in, we’ll see – hope it helps. CCI Quiet Cartridges are very light loads and won’t operate most semi auto pistols consistently. I use them only in wheel guns. Guess that’s why they are quiet….. I had ejection problems, what I did was to field strip the weapon,turn the receiver upside down and pry the ejector a little bit towards the centerline of the receiver,it solved my problem……. What was going on with it was that when the shell was extracted it wasn’t making contact with the ejector which is a piece of stainless flat bar located in the receiver, just bend over towards the center and the shells will now ejector. I have three Ruger 22’s, Mark II, Mark III and a 22/45. Sick and tired of the hassle of cleaning them. Finally cleaned them all and put them in the gun safe for good and the grandson can have them. For a real pistol I shoot my S&W Model 41. That’s one 22 pistol that S&W really got right, but I realize not everyone is going to pay that price for a 22. Looked at the S&W Victory today at a local gun shop. The price is right and just for the hell of it I’m going to buy it in the morning. For me, if you know how many guns you have – you don’t have enough. 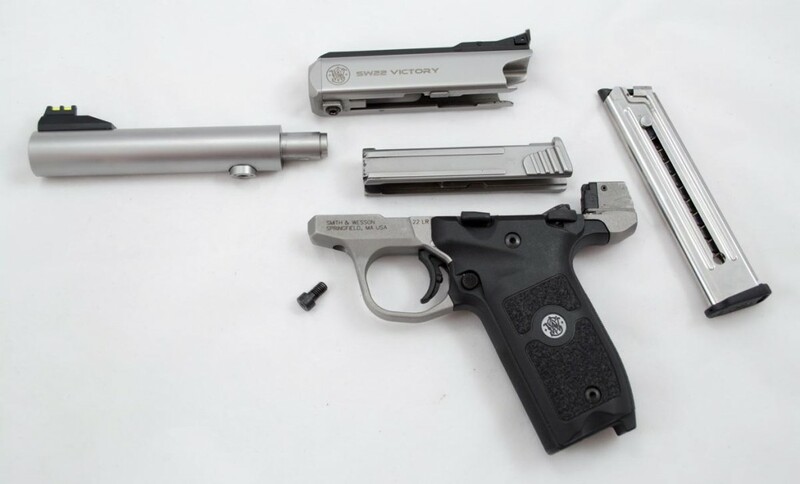 There’s a neat solution to the dreaded disassembly headache of the ruger mark series pistols. Check out MAJESTIC SPEED STRIP on you tube or on their website. It replaces the annoying parts that stymie many owners of these weapons. It also solves the mag disconnect headache and takes up trigger slop and reduces pull… Check out Dino Longorias great invention and start buying up all those Rugers from unhappy owners ! JimD, did you try it out? What do you think? Am looking to buy a new pistol, and am interested in reviews. Thanks. R. Glen mentioned the old High Standard pistols. I’m not talking about the current company. Unfortunately, they have ruined the good name. I’m talking pre 1980s. Back in the day the Colt Woodsman and the different High Standard .22 pistols were considered the best of the best for target and hunting. Yes, the method of attaching the barrel could be tedious, and you would do well to periodically check that it was tight. I looked until I finally found one in really great shape. They are still considered by most to be one of the original “tack drivers”. One day I will find a Woodsman or pre Woodsman also. But the point is; they look about identical also. You can gripe about guns “looking like rip offs”, but face it, copying is the highest form of flattery. I can barley tell the difference between most cars today. One other thing; most of the guns that have gone off on some unique designs often do not fair well. Consider Colt’s last .22 semi auto venture, the Cadet. What a disaster. Yeah, I know they came out with 1911-22, but that is built by Walther, not Colt. But the modular design is where a lot of firearms are going. Here you have a reasonably priced gun, in a cheap easy to shoot caliber, that can be moded to the extent of the owners wallet. And, it seems to be truly well built, and does not require any special tools. Bottom line; if you don’t like the gun then don’t buy one. Beauty is in the of the beholder after all. But why gripe about it? $400 of yaaaaaawn…. Like world needs another POS .22 Pistol, which thanks to all the hoarders, you can,t find ammo for anyway. If these clowns wanna impress someone, maybe they invent an Auto that can SWITCH AMMO to whatever’s available. I’m fine with another excellent .22 pistol, and as far as the hoarders,…They’re all idiot, liberal, douche-bags hoping to get rich off of REAL shooters who have always had several thousand rounds of .22 in reserve! Bought the Victory for wifey. Neither of us could be any happier. I want one now, too! Out of the box: Price. Balance. Smooth. Breakdown. Accuracy. Grips. Perfection as far as I’m concerned . This thing is a Cadillac without all the complexity OR the price. And .22 ammo is available online all over the States, still considerably cheaper than .38 or 9mm. She literally doesn’t ever want to leave the range which is truly saying something! Spingfield, Taurus, also Ruger Mark ll target and Mark lll 22/45 with bull barrels. I didn’t think much about the new Victory until I read this review. I am just a guy that likes to shoot, but I do know the different between good guns and bad guns. I like what I see here with the Victory and maybe I will just go out and buy one. I just need to explain to my wife why I am buying another gun like she doesn’t know. When I first looked at the pictures I thought “hmm. that looks an awful lot like a newer version of a Ruger” but when I got to reading I can see that there are a lot of differences. Not enough to make me willing to spend my hard earned cash for it though. I have a Ruger Mk II in 6 7/8 heavy tapered barrel and it’s great. I also have a Ruger knock off, the AMT which has an 8″ bull barrel in Stainless while the Mk is Blued. I really don’t need both of them but I’m reluctant to sell either one and having them, I see no reason to buy another 22 pistol. I am, however, interested in a new or used 22 revolver. I purchase this firearm last week and am completely satisfied. It is a tack driver, the fit, finish and balance is perfect. I like the adjustable trigger as well and it comes with a rail for optics. Don’t wait to buy this one, I was lucky to get one early. This is a winner. This is not a Ruger knock off, this firearm is easy to break down for cleaning and reassemble, unlike the Ruger. I liked the S&W 22lr auto,when I herd someone yacking about it being a ruger ripoff, Well you apparently aren’t old enough to remember the Colt Woodsman, most of the good autos look like a ripoff of it! Seems like they borrowed the modular design concept from the Beretta Neos which goes for under $300. I’d like to see someone do a side-by-side comparison review between them. The manufactures today seem precupied with producing yet another little CC pistol or another AR15 varient. It’s nice to see something a bit retro. I’d have called it the “Woodsdude”. Owned the Beretta neos,shot groups of no less than 2" @ 25 yards, also had numerous feed jams. Checked the trigger pull it averaged out to 7 pounds way to heavy for pistol. Took back to dealer and traded for the Smith @ Wesson SW 22 took to the range zeroed iron sights for 25 yards and shot 6 out of 10 into 1" bulls eye ! Yes both guns were shot off a rest. Didn't have any malfunctions in 200 rounds of different brands. The Victory a far more superior gun than the Neos. I have an old Ruger Mark 1 with 6-7/8 bbl that is so smooth after over 50,000 rounds that no one that shoots it can believe it! I can hit a 2 liter Coke bottle consistently at 100 YARDS too!! It has taken many squirrels also. So learn to shoot a real pistol with real sights and lube it with dry graphite powder and you won’t have to clean it so often. I also love my Belgium Browning Challengers and Medalists. Real quality weapons made by craftsmen, not computers. Oh how I long for the days of blue steel and finely checkered walnut! Interesting. The lines scream Ruger Mark III with the bull barrell. The described take down and reaasembly sure does sound better than that which Ruger uses on the Marks. I loathe that aspect of my Ruger. Price seems reasonable. Beretta produeces a good .22 semi auto as well. That’s exactly the big difference – the guts and ease of takedown. I agree…..there is nothing like a Stainless Steel gun with a satin finish. Ruger knows how to do it very well. That being said I think this would be a great replacement for my 22/45 Ruger that I sold (without cleaning it first). The dirt I left behind will be the new owners least problem after he breaks it down. Don’t get me wrong…..I’m a Ruger fan…..just not a fan or the 22/45 especially when page 14 of the owners manual says “Hyper velocity ammo is not recommended in this firearm, CCI stingers and such can be dangerous”. This looks promising, but the grips on a 22a feel like a cheap kids toy and these look similar. Wont touch it without a quality grip, will have to find one in a store and see what the grip is like. Everything else seems spot on. To the Ruger lover comments, bout time someone made an was to take down and clean gun. My son and I each bought 22/45s. His steel, mine lightweight. These are, by far, the worst jam-o-magic pieces of junk we ever bought. Mushy triggers, ugh. After spending a fair amount removing the magazine disconnect, installing a good trigger, almost as good as my old Browning Challenger III. Really wanted to like the Ruger due to weight, but sorry. Junk. I do have a SR22 and it is one of my favorites. If they would come up with 5″ slide and barrel, it would be the bomb. Never had a 22/45, but I have had a Ruger Mk1, and currently have a stainless mkII target heavy taper barrel, and a MKII Blued Government model. The accuracy specs for the government model were awesome. These specifications require 10 consecutive shots from a machine rest at 25 yards, all of which must fall within or cut the edge of a 1.25 inch bullseye. The test target that came with mine had a group of under a half inch. Once you get the knack of take down drill, they can be field stripped and back together in a heart beat. Certainly as fast as a 1911. For years, the Ruger MK pistols were the best value for the buck. do own and have owned RUGERS for years. Contacted S&W. This firearm will NOT be California compliant. Too bad. Thought I had an alternative for the Ruger and Browning. Of course, the Ruger is not California compliant. I am limited to the Browning, which is not a complaint against Browning. It’s a complaint against California where I can purchase a far more powerful weapon than a .22LR, but I can’t buy one like this. I found the same problem with a .30 cal Luger which I could buy, but I was prohibited from buying a .22 cal Luger. How stupid. Vote with your feet and GTHO of there. The Ruger Mark III .22 auto pistol certainly is California Compliant because I purchased one (blued) recently right out of my LGS. They are rare. Occasional stainless models show up. They have to get all the way across the continent and Cali gun enthusiast needs are sometimes neglected by our out-of-state brethren. Buckmarks are also available as I saw just the other day. I bought one of the last S&W 22a pistols last year as well. We have some very cumbersome gun laws, but don’t believe every rumor you hear. Amazing! 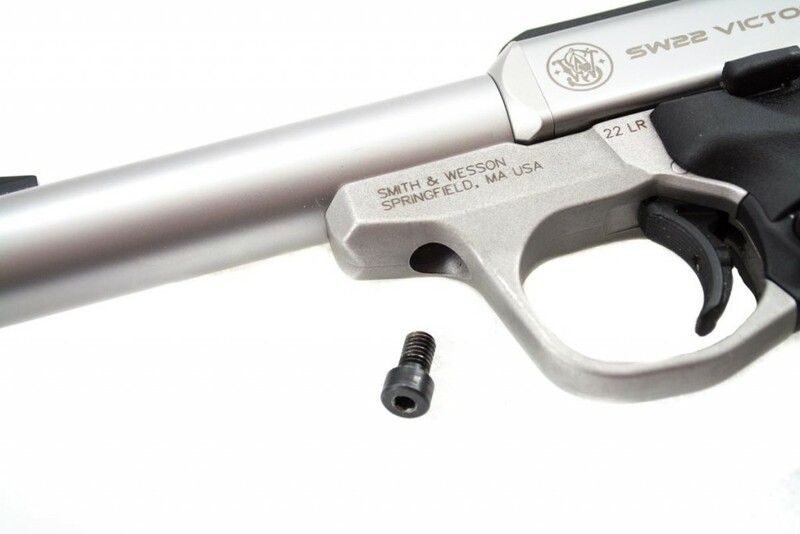 Smith and Wesson have invented the Ruger .22! Note to S&W: If you want to copy an existing Ruger design, at least make it look as good and retain the ergonomic grip design. I can’t wait to see the S&W version of the Colt Woodsman. I agree with Evan in general principle. The industry has moved too far away from good old blued steel. The pinned and recessed frames of S&W’s of the past, are seemingly stuck in the past. And with that, the gun-smithing skills and knowledge seem to be devolving to plastic and built-in disposability of some of these new polymer firearms on the market today. A Ruger LCP .380 can be had for about $229. Well made for what it is, but you could buy one of every color and not break the bank nor ever need a gunsmith for it. The CNC revolution in the industry has made parts and fit and finish much more accurate. No need for hand fitting or tweaking for good operation. 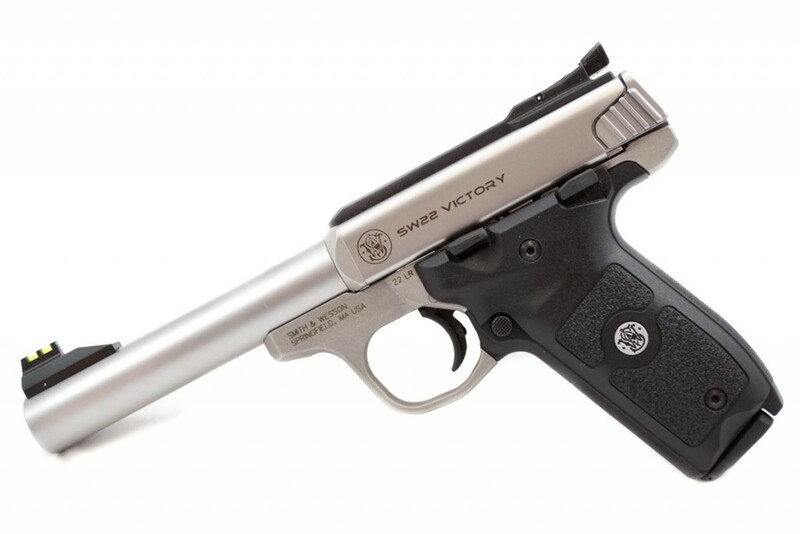 – But this new S&W Victory model has my interest. I think it looks like quality. Has several features that should give the gunsmith a bit more of a smile than a scornful scowl. – From what I can see, it looks like it may have overcome High Standards’ weaknesses with the use of stainless and the positioning of the screws and that large mounting hub. —- I want one. With every choice of barrel too! Granted that there is no comparison between the two calibers but fill up one of your pockets with 22 LR and another with 30-06 and see how many rounds of each you can carry when or if you need to. Meet new pistol, same as old pistol. The most egregious remainder of the old is the crappy mechanism used to remove the barrel from the receiver; big wow about grips–whomever decided the magazine release needed to be in the center of the really horrible hand grip should be banned forever from firearms design; the mags are slow to load (not to mention re-load) and are still at the ‘ban’ level of 10 rounds max. or one of those GREAT well made rugers that only need take down and cleaned once every thousand rounds or so…………..
I’m struck by the similarity to my Buckmark. Can we say Ruger Mark 1, 2,and 3. Its like all the polymer guns that look close to the Glock. It started the Tupperware gun industry. I purchased a S&W 22A 4 years ago, then read the reviews from all the so called professional hand gun owners. At first I was concerned about it’s quality and dependability, but to my surprise it appears that those slamming this gun have never owned or shot a 22A. If this new 22 is a sweet as my 22A she’s a keeper. I take my S&W 4″ 357 mag, 2 Jennings 22’s( which I love to shoot,) my 357/38 Ruger , Kel-Tec p-11 9mm , Kel-tec 380, And my 22A to the range at least twice a month if not more. All my weapons are fed the cheapest ammo I can find, and I shoot all weapons religiously( no pun intended) My S&W 22 and my Kel-Tec P-11 are the most accurate of all, and not one , not even the junk Jennings have ever had even 1 issue. Do us all a favor and remember what we learned in Kindergarten, ” If you have nothing nice to say, don’t say anything” . Thank you. I was beginning to believe I was the only person to like the 22A and P11. I own a S&W 22A. It is a handsome firearm and very accurate. Unfortunately, the criticisms are valid. I was plagued with failure to fires, failure to feed and some ejection issues; sent it back and they replaced the barrel with some improvement. I do not use the firearm any longer and am trying to sell it. It’s reputation has preceded it and virtually will have to give it away. I purchased a Ruger MK lll Hunter and love it. 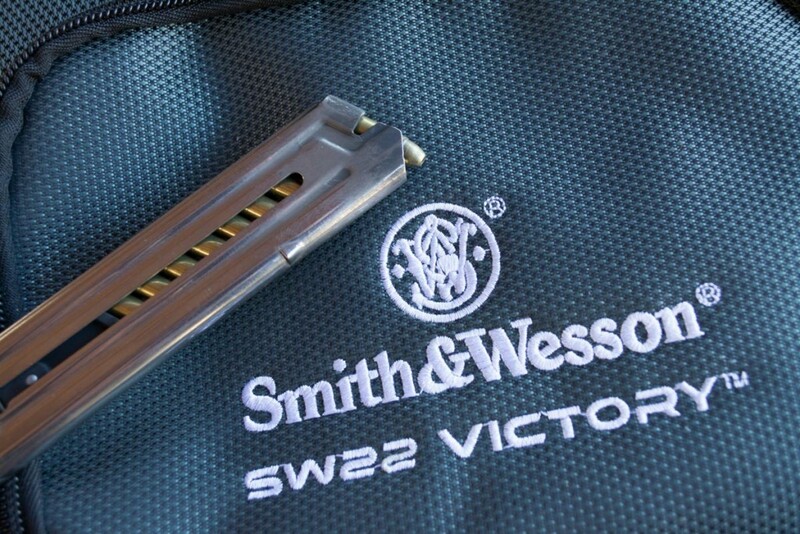 I am looking at the S&W Victory 22 but bases on my experience will wait on reviews. Here’s my 2 cents worth. I like the modular concept and see room for longer barrels, and some match qualities. I like the option for adding suppressors, fluteds, carbon fiber and other barrel accessories. The takedown is a simple concept but why prey tell … why did they choose a freakin Allen wrench for the take down? I can field strip a Cold 1911A1 variant in .22 using my hands and no tools. Why not put a folding tab type takedown bayonet type “screw” that pushes in and locks into the pistol frame forward the trigger guard so that all you have to do is snap it up pull out and turn? Your chances of thread slippage or stripping go from good to zero. And just to add some flair to it, install a type of detente so the screw can’t fall out and get lost in the brush, sand or swamp? As for the Ruger Mark’s, Ruger and some after-markets changed the configuration of the trigger group to make it easier and less painstaking to get the receiver and bolt assemblies off the frame. Years ago High Standard had a similar takedown screw assembly and that never worked out over time. The screw would loosen, the barrel would not flush to frame sometimes or seat improperly, and it was a pain. A gunsmith friend of mine modified my cheapo HS .22 so the screw was eliminated with a thru bolt that was easy to push and pull out. It was the only way to salvage an otherwise good plinker. Just got S&W victory that I love. Have had a ruger Mark 3 abt 3years and if you know how and the tricks you can take down and put it back together in 5 min. Easy. As an ex Ruger Mark I owner, I’m interested in getting my hands on one of these. I loved the Ruger, but cleaning it was such a pain that at some point, I quit shooting it. The fact that this gun can be easily customized is a great plus for me. For the first time since I got my first Ruger Single Six decades ago, I’m excited about getting a .22 handgun! Thanks for the update! Oh how I miss the days when Smith & Wesson made real guns! I’m confused about…..Evan. Trolling or just negative about new stuff. 36.0 oz. Synthetic? Ruger should have made theirs correctly. I had the same issue with California. After living there since 1960; I moved to Arizona an 2011, that solved the problem. It’s good to live in America again. I don’t like the finish. The frosted finish will mar and scratch easy and there is no way to return it to new. Also the laser etching can’t be refinished either. A brushed stainless finish with laser engraving would have been much better in terms of keeping it in new shape. I’ve spent my entire life working on guns. This is a profession for me NOT A HOBBY!!!! I taught gunsmithing for a community college for over 20 of those years and I plan on being involved in this business for a long time to come. All of that brings me to a very pointed question; is anyone else out there tired of synthetic guns? Just try re bluing, welding, or even preserving such ‘firearms’ in order to pass them down as an heirloom or collectible. I will not sell these new S&W .22s because I will not be able to service them. I’m a relatively new gun owner and I agree with you. I enjoy holding a metal framed gun over polymer frame. Hence my next purchase will probably be a 1911. But the manufactures can produce guns at a faster rate and it costs them less in material and tooling. Combine that with consumers demand for lighter guns to conceal carry and we see a flood of polymer framed guns. I’m a little confused. This is a stainless steel framed gun. Are you referring to the satin finish as difficult to work with? The only thing polymer is the grip. Sadly, Sir, I believe you are correct. Gun manufacturers make what the market wants, and few people under 40 have any appreciation for guns as things of beauty to be handed down generation to generation. The days of Hemingway and Roosevelt and fine blued steel, wood stocked guns that are made as much to be admired as used are gone forever I’m afraid. I’m 65 ys old now so I grew up and learned to drive during the age of muscle cars. Cars were a big part of life back then. Guns are sort of like cars. There were great guns being made when I was young. It was before the gun industry learned how to make hand guns out of plastic. Just as the generation today will never know the thrill of driving a new 426 hemi or a 427/450 HP Chevelle, they will never know an all steel gun market. Yea, you can buy an all steel gun, but it’s gonna cost you. New cars just blow away those old misfitting, rusting out POS cars they made in the 1960’s. Our engines are vastly better machined, we get loads more power and use less fuel doing it, and the new vehicles handle and brake so much better. I know, I spent over 40 years in a technical position with a couple of different manufactures working hands on from the inside. As for guns, the old ones were pretty. They had a lot of hand work in them and needed it as their machining was not nearly so accurate. You can still buy beautiful guns but you will pay a heavy price for them. And it is true, these plastic guns won’t be here for our grand kids. Maybe that is a good thing because they will probably have something far better…or they will be outlawed anyway. Who knows? I totally disagree. We live in the golden age of firearms right now. It used to be you couldn’t buy a 1911 from anyone without a substantial amount of fitting and aftermarket work. Now you can just buy a Colt, Springfield, even a Taurus, and they just work out of the box, really well. These plastic guns will be here forever. I agree. The cars I owned in the 60s and 70s were not reliable. My Barracuda rusted out after 3 years and the steering was awful. I love steel revolvers but I also realize a good polymer pistol is reliable and practical. I have a CZ 75 9mm, it’s all steel, great quality, extremely ergonomic and costs under $500.00. I wouldn’t say steel is going to cost you. For most people would rather have steel but it comes down to the weight issue. There is also a huge offering of good quality, steel 1911’s at really affordable prices. Yeah, you have to do some research but I don’t think it’s going to cost you. What are you talking about? None of the barrels shown are blued, you CAN weld stainless, and only the grip panels are plastic. This seems like a gun smith’s dream, not sure why it’s your nightmare. Like the author stated: “The frame, bolt, and barrel are all stainless steel.” And, Evan, why such anger: “This is a profession for me NOT A HOBBY!!! !” I truly believe that this kind of negative attitude has set a horrible stereotype in the firearms world. Maybe it’s about time you retire and enroll in a comp. and lit. class at the community college you taught at for 20-years, so that way you will finish reading an article from start-to-finish as well as understand its material. Just saying. I use everyday. I tend to prefer synthetic/stainless guns over blued/wood. Why? Wood is heavy and if its pretty wood, I feel terrible when I ding the stock jumping out of the jeep. And bluing? What a horrible finish for steel. I know, its pretty and traditional, but it just does not work as a preservative. I don’t think you will have to worry about passing guns down as heirloom. All the crazy people in this world today will stop that. Sometimes it is very frustrating to live in California. I have been looking to replace my (innacurate) Mosquito with something very accurate I could enjoy punching holes or cans with, and this fills the bill. Except that it cannot be qualified for the Roster of Approved handguns.